Be there when help is needed - regardless of age, most people need 7 – 8 hours of sleep each night. As we age, though, sleep becomes more fitful. Experts say that as early as the age of 40, the number of nocturnal awakenings start to increase. Many people get up during the night to use the facilities or to take medication with no adverse consequences. But too often adverse health events or falls occur at night or in the early morning hours. Elderly persons – even those who appear to be strong and in good health – are not quite alert and not paying attention. They trip, lose balance, and fall even in the most familiar surroundings. It may be hours before someone comes to help. With the SAFENBED™ exit alarm, you’ll know when someone leaves their bed – and if they don’t return – so you can be there to help. The SAFENBED™ Bed Exit Alarm only sounds when a person fails to return to bed after a predetermined amount of time. There are no false alarms, and no need to enter the patient or resident’s room when it’s not needed so privacy is maintained. The SAFENBED™ Bed Exit Alarm is easy to set up and operate. Use the nurse call cable to plug the monitor into your nurse call system and connect the bed or chair pad. Talk with the patient or resident and select the time delay 10, 20, or 60 minutes. Choose the volume alarm level and the alarm mode – either buzzer or chime – that will sound five minutes before the alert sounds to remind to the patient or resident to get back in bed. When the person moves off the pad, the timer starts. If the person does not return to bed within the specified time, you’ll be alerted so you can be there in time to help. 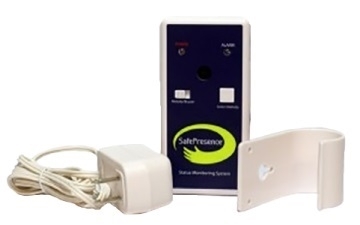 The SAFENBED™ Bed Exit Alarm is simple to use. A bed (or chair) pad is plugged into the unit and when the patient gets off of that pad, the unit starts alerting loudly. A timer delay can be switched on so it won't alert for 2 seconds, 5 minutes, 20 minutes, or an hour. If the patient gets back on the pad before the time is up, the timer is cancelled. We think it is most useful for couples sharing a bed, or a caregiver who sleeps either in the same room or the room next door.